WP Glossary Created with Sketch. No results found for . Try something else? Definitions of words that you come in contact with when you use WordPress. 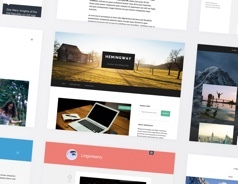 Free WordPress themes for bloggers, photographers and businesses. In WordPress, the term "front-end" usually refers to the publicly accessible parts of a WordPress website. That includes the websites’ front page, sub pages, blog archive, blog posts, and so on. The opposite of the front-end is the back-end, which in WordPress parlance is usually used as a synonym to the administration panel. Only logged-in users can access the administration panel of a WordPress website. In WordPress, the term "back-end" is usually used as a synonym to the administration panel. User is the word used for an account on a WordPress site. I’ll take a look at your suggestions and see if any updates should be made. No promises! I’ll take a look at your word suggestion and see if it should be added to the glossary. No promises!